Fiona was born at the Cincinnati Zoo in January 2017. She arrived nearly two months early, before her body was strong. That meant her body was smaller than that of other baby hippos. Her birth weight was so low that Fiona’s caregivers feared she might not survive. 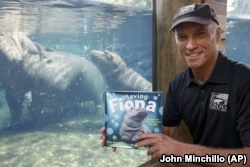 The latest book is called “Saving Fiona,” which the zoo’s director wrote. “She has taught us a lot,” director Thane Maynard told the Associated Press. A Cincinnati Zoo worker collected milk from Fiona’s mother Bibi by hand. And the Smithsonian Institution’s National Zoo in Washington, DC helped develop a highly-nutritional food product for her. Workers from Cincinnati Children’s Hospital were asked to help inject nutrients directly into her bloodstream. Maynard’s book is aimed at young readers, telling them the story of Fiona’s struggle to survive, while also teaching them about hippos. It includes many facts about the animals, such as the fact that adult hippos only eat plants, but can run faster than people. The book also notes adult hippos can be dangerous because of their size – weighing up to 2,270 kilograms. Stephanie Smith is executive director for Scholastic News for students in grades three through six. She says youngsters love Fiona’s story. “Kids will just gobble it up. It makes teaching easy,” she said. We want to hear from you. 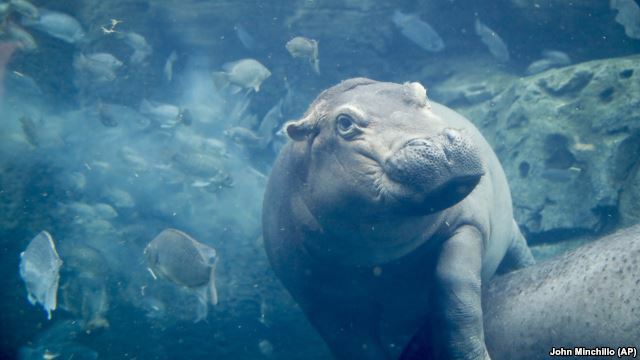 How do you think the attention on Fiona might affect how people treat animals and the environment? Write to us in the Comments Section or on our Facebook page.